Early on a Saturday morning, 11 Fashioning Circuits volunteers, ranging from 11 to 50-something years old, trekked down to Southern Methodist University for the Fall installment of the Design Your World conference, for 4th and 5th grade girls. Our volunteers included current and former students, parents, daughters, and friends from neighboring universities. The event was organized by the Dallas Society of Women Engineers (SWE) in partnership with the SMU chapter of SWE . They invited Fashioning Circuits to lead an all day “Electronic Fashion Camp” workshop for twenty girls. In the morning, the workshop included an opening discussion about Fashion as Communication, an introduction to the concept of physical computing, and a coding workshop and time for geeking out and messing around with the Lilypad Arduino. 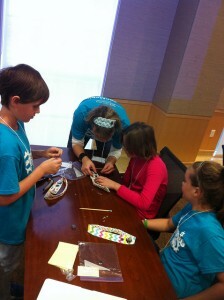 The afternoon was focused on a take home project – a twinkling headband! It was a really fun day. The girls who attended that day learned a lot but we also learned a few things. Lessons that we learned include that you can never have too many pairs of scissors and that for future workshops we should not be tempted by the inexpensive sewing needle multipacks – many of the needles had eyes that were so tiny they were very difficult to work with! This was our first workshop for a group this young that included a take home project. Our strategy of gluing down the LilyTwinkle, LEDs, and battery holder in advance worked quite nicely. According to the Dallas SWE’s writeup of the event, 82% of the kids responded that they would attend a Design Your World event again, and 88% responded that they would recommend the event to others. We hope that our numbers for Fashioning Circuits were even higher. Lance and other volunteers help the girls during the coding activities. 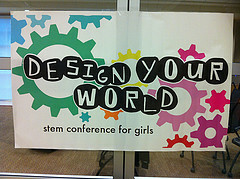 Several of the women associated with the Fashioning Circuits blog recently took their skills to the Design Your World Conference to teach young girls aged 10-12 how science can be fun. 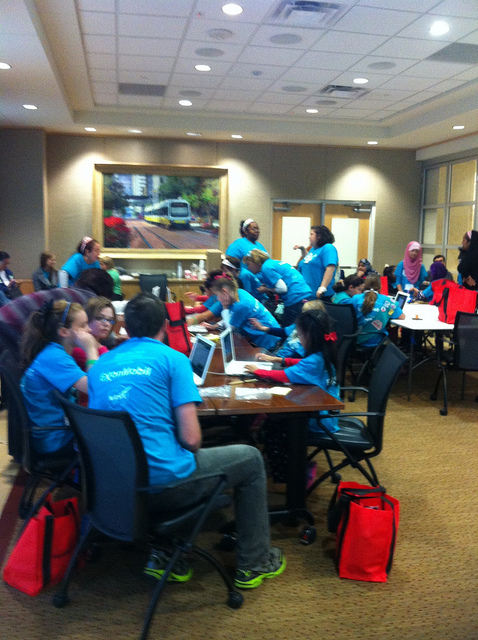 Specifically, with the coordination and leadership of Amy Pickup, we conducted a workshop about the LilyPad Arduino. 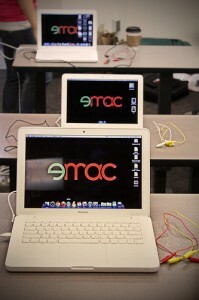 The computers were set up and ready to go when the 15 girls came in and we were ready to teach! Amy lead a great discussion on the history of the LilyPad Arduino, then showed a video with some example projects, and went over all of the elements and add-ons for the LilyPad. Then it was on to the brainstorming session. Each of the volunteers took a group of 2-3 girls and helped them come up with ideas and ways to use the LilyPad to create new clothing designs or functionality. It was really interesting to see what their young minds came up with. Two themes that I picked up were dealing with fear of the dark, like a glowing teddy bear that turns off after a set amount of time, and creating fun gimmicks to wear at school, like a backpack that blinks your name. Other ideas included glasses that would make a sound or light up if you lost them, and socks that would tell you when they are stinky.